A drenching rainstorm that could turn the hospital into an evacuation center signals the start of a wild poker game. This is it, the final episode of AfterMASH. 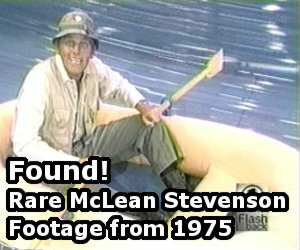 Viewers in the United States didn’t have the opportunity to see “Wet Feet” because CBS never aired the episode. It did air in other countries, including Australia. Someone uploaded a copy of the episode from Australia to YouTube in September 2016, finally allowing fans the chance to watch it. It’s another packed episode, with multiple storylines tied together by a major storm and the threat of flooding. All medical personnel are on standby so Father Mulcahy suggests a poker game. Like the poker games on M*A*S*H, characters drop in throughout the episode, playing a few hands before they’re called away. Alma Cox is happily at work as disaster coordinator because the hospital is the evacuation center for the county. She tries to seduce Wally Wainright into giving her her old job back, but he wants nothing to do with her. He does want the publicity that comes with being in charge of a hospital during a massive storm. Dr. Dudziak has a patient who doesn’t like the rain because it reminds him of Korea when the Chinese always attacked while it rained. Dr. Caldwell gets into trouble when he doesn’t realize a patient with a broken arm also has a ruptured spleen. Alma tries to seduce Wally. Also, Klinger insists he’s Noah, complete with robes and a pair of goats. And Bob Scannell wins big at poker by pretending he doesn’t know how to play. There’s an impressive scene near the end of the episode when casualties from a twister show up at the hospital. Everyone goes to work. Klinger sheds his crazy persona to take charge of triage while Father Mulcahy helps a man with a neck wound. “Wet Feet” is a regular episode, not a series finale. There is no ending for AfterMASH, no closure for the characters, no resolution to Klinger’s storyline. But it’s a solid episode and proof the show had unrealized potential. Alma Cox attempting to seduce Wally Wainright in this episode is bizarre. She’s given such a large role in so many episodes yet adds nothing to the show. I’m convinced the writers weren’t sure what to do with her character once Mike D’Angelo was written out after Season 1. It’s frustrating to see her more than Father Mulcahy, who’s already small role during Season 1 became even more limited in Season 2. In “Wet Feet” he’s seen at the poker game and briefly during the triage scene. Now that I’ve watched every episode of AfterMASH, I’m more certain than ever that CBS effectively killed the show by insisting on so many changes for Season 2. Klinger never should’ve gone on the run. If the network wanted him acting crazy again, which is a change I don’t agree with, it should’ve happened unseen between seasons, and Season 2 should’ve opened with him already in the psychiatrist ward. As I’ve said before, adding Dr. Dudziak to the supporting cast during Season 2 was a smart move. I’m not convinced AfterMASH also needed Dr. Caldwell, although the character shows some potential. But he’s not all that different from Dr. Pfeiffer, who was written out halfway through Season 1. AfterMASH is not a terrible show. It’s not even a bad show. It’s an uneven show, with a mix of solid episodes, mediocre episodes, and weak episodes. It had big shoes to fill as a spin-off/continuation of M*A*S*H, and it couldn’t fully fill them. No show could’ve lived up to the expectations of viewers. AfterMASH is not M*A*S*H and that’s the big problem. But it doesn’t deserve to be condemned as one of the worst TV shows of all time, as TV Guide did in 2002. “Wet Feet” never aired in the United States. CBS scheduled the episode twice but pre-empted it both times. It was originally supposed to air on Tuesday, December 18th, 1984 but the network aired the animated special “Jim Henson’s Muppet Babies” instead. Months later, CBS scheduled two episodes of AfterMASH back-to-back from 8-9PM ET on Friday, May 31st, 1985: “Wet Feet” from 8-8:30PM ET and “Saturday’s Heroes” from 8:30-9PM ET. At the last minute, after weekly TV listings were printed, the network altered its schedule to make room for a CBS News special about tax reform. According to daily newspaper TV listings, “Saturday’s Heroes” aired from 8-8:30PM ET, followed by a repeat of a 1983 made-for-TV movie called Listen to Your Heart from 8:30-10:30PM ET, and finally a CBS News special titled either “Tax Reform: Other Views” or “Opposing Viewpoints,” depending on the source. “Wet Feet” also wasn’t the last episode produced. “Ward is Hell,” which aired in December 1984, was the ninth and final episode produced for AfterMASH‘s brief second season. A script for at least one additional episode (“All Day All Night, Mary Ann” by Ken Levine & David Isaacs) was completed but never filmed. Soon-Lee and Mildred do not appear in this episode. “And I didn’t even hear the choppers,” Klinger says after an announcement about incoming patients. This is the 12th and final episode written or co-written by Dennis Koenig. This is the second of two episodes directed by Hy Averback, who directed 20 episodes of M*A*S*H between 1972 and 1982. Guest star Arlee Reed previously appeared in the M*A*S*H episode “Trick or Treatment” during Season 11. Guest star Denis Flood perviously appeared in two episode of M*A*S*H: “Where There’s a Will, There’s a War” during Season 10 and “Goodbye, Farewell and Amen” during Season 11. Several reasons this isn’t a finale. First, as you point out, there was a script for the 10th episode, “All Day, All Night, Maryann” written and ready. Since there was no regular character named “Maryann,” perhaps Ken Levine will someday address either here or on his blog. Second, when a show was renewed in that era, it would have been renewed for either 13 or 22 episodes. Let’s assume a minimum of 13. So then CBS negotiated with Fox to cut back the order to 9 finished episodes (and you can bet Ken Levine & David Isaacs were paid for that 10th episode script). So the show itself found out at the relative last minute it was canceled. Not enough time and no interest on CBS’s part for a finale. The other thing about AfterMASH, while it wasn’t a great show – and I recently watched all episodes myself – is that it feels like a more contemporary comedy today than it did in 1983. It is a single camera show. It isn’t as funny as a multicam. it does have a lot of continuing storylines (i.e., the characters evolve). A lot of things that it would have been dinged for in 1983 it would be praised for in 2019. Still not a great or successful show, but TV shows today are closer to AfterMASH than AfterMASH was to other shows in 1983-85. Lastly, even AfterMASH’s second season ratings would make it the #1 show on TV today. Times have changed. Thank you very much for these recaps. It’s been great fun revisiting AfterMASH week by week with your summaries. I watched most of the series on YouTube a few years back and have been rewatching as the reviews have posted. I totally agree that the overhead shot of the arriving casualties near the end of this episode is really impressive–for me, that was a strong callback to M*A*SH itself. Correction — and I know this to be a 100%-I-would-bet-my-life-on-it accurate fact because I had the family TV on that Friday night of May in 1985: The CBS news documentary aired during 8:30 to 9:00 p.m. that night. (NOT 10:30-11:00 p.m.) “Saturday’s Heroes” began at 8:00, and then suddenly — out of nowhere — Dan Rather’s face popped up at 8:30 when we were supposed to get the 2nd of the final two episodes of “AfterMASH” during that hour. I watched for a couple of minutes, baffled as to what was going on, and wondering if this was just a brief news break or something that would be ending soon before that previously-advertised final episode would be coming on. Earlier in 1985, I had also received an 8×10 signed photo from David Ackroyd (“Dr. Boyer”) in response to a fan letter, and he wrote a note on the photo saying that I could “look forward to seeing the final 2 episodes back-to-back in the spring.” So, CBS had been planning for a while to run those last 2 episodes together …. and gave zero notice about the sudden switch regarding the final segment.